Jane Pinge Service Details - Bellefonte, Pennsylvania | Wetzler Funeral Home, Inc.
Jane L. Pinge, 90, of Vero Beach, FL (formerly of Kittanning, PA), passed away on Friday, September 7, 2018 at VNA Hospice House in Vero Beach, FL. Born on October 3, 1927, in Bellefonte, PA, she was the daughter of the late Edwin and Dorothy (Heaton) Peters. On June 18, 1948, she married her high school sweetheart, Frank R. Pinge, who preceded her in death on August 20, 2003, after sharing 55 years of marriage together. Jane is survived by her three daughters, Arla Howlett (John), Lorie Pinge, and Jaci Swarts (Paul); three granddaughters, Julia Plaza-Ponte, Gretchen DeRose, and Calli Swarts; and three great-grandchildren, Helena Plaza-Ponte, Eli DeRose, and Henry DeRose. 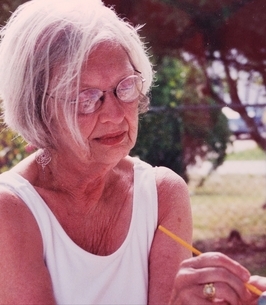 Jane is remembered as being a loving mother, grandmother, and homemaker. She loved cooking, arts and crafts, fishing with Frank, and the many other husband and wife projects that she and Frank were involved in over the years. She had a wonderful sense of humor, enjoyed the computer and online shopping. She was a member of First Baptist Church in Kittanning, PA. Above all, Jane was always devoted to her family. Graveside services will be held on Monday, September 17, 2018 at 1pm at Union Cemetery in Bellefonte with Rev. Calvin Miller officiating. Arrangements are under the direction of Wetzler Funeral Service, Inc. in Bellefonte. In lieu of flowers, memorial contributions may be made in Jane’s memory to the American Lung Association at 3001 Gettysburg Road, Camp Hill, PA 17011, Hospice/VNA at 12565 West Center Road, Suite 100, Omaha, NE 68144, or to First Baptist Church of Kittanning at 334 Arch St, Kittanning, PA 16201. To send flowers to the family of Jane L. Pinge, please visit our Heartfelt Sympathies Store. My deepest sympathy in the loss of your mother. I just read the tribute in the paper. Your mother was such a beautiful woman...her picture shows this outward beauty and you know the inner beauty she shared. May wonderful memories help you during your healing from this deep sadness in your lives.